Black Panther famously debuted in Fantastic Four #52 in 1966. He preceded the Black Panther party by a few months. As far as I've been able to determine, that the Black Panthers used that name had no relation to the Marvel character in any capacity; it was just a bit of circumstance. The Black Panther character (whom I'll refer to as T'Challa to avoid confusion) became something of a surprising regular in Marvel comics. After a year of sporadic appearances in Fantastic Four, he pops up with Captain America over in Tales of Suspense throughout 1968 before becoming a regular in Avengers through 1975. Meanwhile, the Black Panther party gained a lot of media attention. Although it was initially founded to monitor police activity after a spate of police brutality against Blacks, they soon established themselves as a movement to uplift Blacks as a whole, instituting a variety of social programs in predominantly Black neighborhoods. Free breakfast programs, health clinics, and the like. However, FBI Director J. Edgar Hoover took exception to them and launched a no-holds-barred campaign to dissolve the group. Many of Hoover's directions were flatly illegal, and even included assassinations of some top leaders. But because he had the backing of the government, much of what he did was given a pass and the media blindly bought into his claim that they were "the greatest threat to the internal security of the country." Investigations on Hoover's claims were non-existent until well after the party's demise, thus the public was fed a great deal of misinformation throughout the 1970s, giving the Panthers a decidedly negative public image. So in that light, it's somewhat surprising that Marvel -- a company of white men catering primarily to white boys and men -- not only kept T'Challa around, but used him fairly regularly. Even if they were making an active choice to be a progressive comic book company by featuring a primary Black character, the name had some poor connotations, thanks to the media. 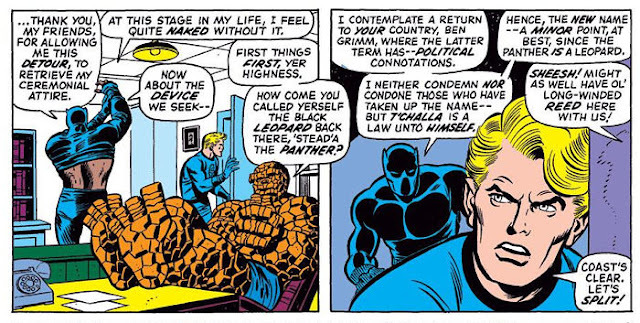 What isn't surprising, then, is that in Fantastic Four #119 from 1972, T'Challa announces he's changing his name to Black Leopard, specifically to avoid any "political connotations." Presumably, because of not-exactly-pinpoint publishing scheduling, writer Roy Thomas -- who happened to be writing both Fantastic Four and Avengers at the time -- largely avoids either name over in Avengers, simply referring to the character as T'Challa for several issues. Now, whether Thomas opted to make the change on his own, or if it was a directive from someone else at Marvel, I can't say. My guess (based only what what I know of Thomas and not on any actual evidence) is that it was a passing comment made by Stan Lee, and Thomas squeezed it into whichever book he was working on at the time. While not exactly corroborating evidence, it is worth mentioning that "Black Leopard" is never used outside that one Fantastic Four story, and T'Challa returns to "Black Panther" without comment a few months later back in Avengers. That hardly seems like something that would happen if Thomas himself wanted to make the change based on whatever political and/or creative ideas he himself had. I think "Black Leopard" was a bad idea. Although "Black Panther" had some negative connotations in some circles, the more progressive readers Marvel was trying to cater to held a more favorable (or at least, not as negative) view, plus it was a great draw for Black readers, since DC had no Black superheroes at the time. (Green Lantern John Stewart didn't debut until the same time that FF #119 came out.) Not only could Black readers see a character that looked like them in a Marvel comic, but his name evoked a lot of power and pride in his skin color. The character of T'Challa is an impressive one as it is, especially considering the time and socio-politico climate when he debuted, but deliberately referencing another group of powerful real-world heroes (to the Black community) made him all the more impressive. It would seem that Thomas appeared to recognize that, fortunately, and "Black Leopard" remains a very minor footnote in T'Challa's long history. I recall a panel in an Avengers comic in which T'Challa reclaims the Panther name--basically saying that no matter how others use it, he IS the Black Panther. Unfortunately my collection is stashed away so I can't cite an issue number, but somewhere in the #70s or #80s. If I get a chance I'll dig it out.